e have been offering the finest and most comprehensive selection of cupolas and other building, yard and garden ornaments since 1985. Here you will find the cupola industry's top manufactures of quality cupolas including Good Directions, Royal Crowne and solid copper cupolas from Cupola Depot. We have more than 200 styles and sizes in copper, Azek Vinyl, and natural woods like hand selected cypress and Western red cedar. No matter your building size or style we have the perfect cupola to top it with, we also offer totally custom cupolas as well. 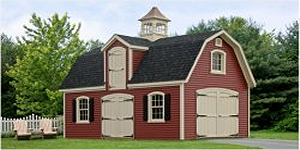 Cupolas for barns, sheds and garages add a finishing touch that will always add value and charm to your structure. 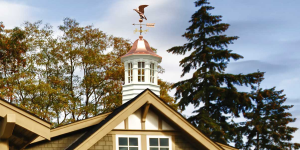 A cupola can be a crowning touch all by itself however it can also be the mounting point for a unique weathervane or rooftop finial. Ever since the cupola was introduced, it has found a comfortable and decorative resting place atop many a family garage, animal barn or yard and garden shed. 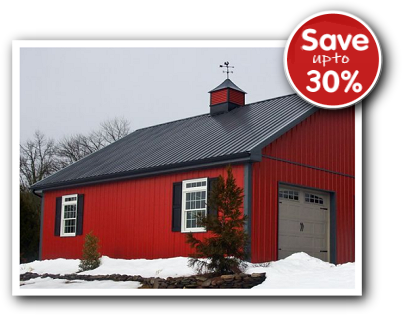 There are specific styles of cupolas that are better suited for the barn, garage and shed and we have over 100 to choose from. Beautifully designed, architecturally sound and guaranteed to withstand the elements. A range of styles and sizes to complement any home or commercial building. Available in vinyl and hand selected natural Earth cypress wood. We are also very proud to have been selected to offer our clients with homes of distinction the Smithsonian Institution collection of cupolas. Thirteen (13) unique styles available to choose from in sizes ranging from 18" to 84" square. The Weathervane Shoppe offers the complete line of cupolas by Royal Crowne. Royal Crowne Cupolas manufactures high quality cupola. Our Royal Crown cupola selection features maintenance free cellular pvc-vinyl cupolas, western red cedar cupolas, copper cupolas, premium grade white pine cupolas and metal cupolas. Thirty(30) unique styles available to choose from in sizes ranging from 24" to 72" square. Hand Crafted Copper Cupola originals that reflect a perfect combination of old world distinction and true old world craftsmanship. 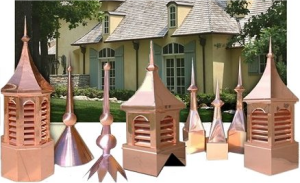 These are our top line solid copper cupolas and roof accents. 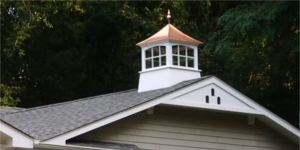 These cupolas and custom roof accents are designed to give your property added appeal from any angle. If you desire a top of the line roof accent, this is the top of the product line to consider.Proudly hand crafted of solid copper right here in the USA. Eight (8) different standard styles and sizes available to choose from as well as totally custom built copper cupolas based on your specific project needs. QUESTIONS? / 574-344-9393 / ASK FOR NICK!! "If you have a question or want a personalized deal, don’t hesitate to call (574) 344-9393 and speak to me personally. I ‘m available to take your call Monday through Sunday from 9am - 9pm EST. I am always offering great deals and extraordinary customer service on these high quality lines of cupolas. Style choices include windows or louvers, smooth or overlap bases and copper or wood pagoda and hip style roofs. Construction materials such as copper, hand selected cypress wood, and low maintenance and easy care vinyl products are used and assembled by skilled trade craftsmen. Our cupolas are available in a range of sizes from 18 to 84 inches square"